Wine Bottle Candles. 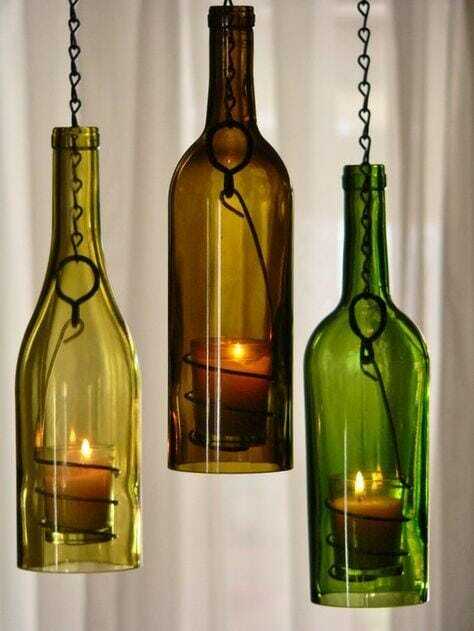 There are many interesting wine bottle crafts that you could make out of empty bottles you have accumulated. Easy DIY instructions on how to make your own Wine Bottle Candles. These bottles of wine are made of strong materials and they also come in attractive colors. You can easily create all sorts of things out of them. You can make a whole lot of decorative and useful things out of these bottles as long as you have some creativity. Imagination has no limits. Today it is possible to create many new things from a small thought which gradually becomes a magnificent reality. And designing is really one of the best activities that a person can perform, giving free rein to creativity and translating them into a role is quite relaxing, however, taking it to reality is perhaps the best satisfaction that can be achieved in all this process. Melting the bottles into free-form shapes gives you the opportunity to make unusual vases and artifacts. Also known as slumping, this is usually done in a potter’s kiln because you’ll need high temperatures for the job. Among current trends, we find a very particular one that has been brewing for a long time but it is today that it begins to fully demonstrate its great potential. The recycling wave is being talked about. Today’s society has finally understood the importance of caring for the environment and working hard for it. That is why they have joined the wave of working with materials of profit in order to reduce the consumption of all those plastic objects polluting that are produced to meet the demands of consumers. In this sense, many fun and useful ideas have emerged to create objects with recycled materials which have made life very easier and keep the planet greener. It should be noted that this also promotes a more creative and economical society. An example of this is the Wine Bottle Candles, created to illuminate with the best ecological style your home, besides giving an elegant and vintage touch to space where you place them. Wine Bottle Candles are very easy to make. First of all, search the internet for various design ideas and choose the one you like best or create your own. When looking for, you will find that the colors of the bottles can vary. From green to red and even yellow, the bottles will find them in different presentations which will make your project much more colorful. After you select the bottle you will use, it is time to cut it. With a marker, indicate the place where you cut it (this will depend on the model you have chosen), then you must draw a surface cut on the marked part. As a next step, apply heat for 5 minutes over the part you are working on and after this, immerse the bottles in cold water. In this part, the temperature change will cause the material to react and cut into the desired part. It should be noted that you may have to repeat this process several times until the glass is cut. When finally the bottle is cut, sand the cut part in order to avoid any deep cut when we are decorating or using it. After you already have the bottle cut, decorate it as you see fit. You can use ribbons, markers, paper and even frosting. Whatever you want! The last step of all this process is to choose which part the candle will go to. The size of this also influences as you can put a thin on the mouth of the bottle or a very wide in the bottom of the bottle. DIY Wine Bottle Candles. Being good with your hands and tools with the right information on how to make different wine bottle candles crafts. Glass is not an easy material to work it, particularly since it can break easily if it is not handled in the correct manner. You’ll definitely need to be able to cut glass or drill holes into it in order to make a variety of things. For instance, a regular bottle wine can only be used as a bud vase; it should have its neck cut off in order to accommodate more flowers. DIY Wine Bottle Candles. You’ll need a few specialized tools in order to work with this material. Most hobbyists have a tile cutter or a buffer wheel at home. A power drill should be equipped with a special glass-cutting tip in order to work on glass. A special glass-cutting wet saw will be required to cut wine bottles into the right shapes. You should also consider learning about the art of decoupage so that you can decorate your glass bottles properly. DIY Wine Bottle Candles. You need to be very careful when working on glass. Since this material breaks easily you need to wear protective gear. Such as goggles and gloves before you start to work on them. You will also probably need a sufficient number of bottles (even beer bottles will do) so that you can get the hang of working on this material. You’ll be really pleased with the results of wine bottle candles crafts. If you like this video ” DIY Wine Bottle Candles ” please share it. I enjoyed looking at your wine bottle candle. Making and love the idea if repurposing items to help the planet. I am concerned though about the label. I love it and it is the best part of any bottle but, when you are selling your finished craft made with recycled, labeled wine bottles, can you get into trouble with trademark infringement when keeping the label on your bottle? Hello Ms Susan. Thank you for your comment. I really don’t think you will get into trouble because of the label. You are re-using the bottle, and not using their label in a way that can damage the company in any way. I’m not a lawyer. So if you are not totally sure I would go for the options below. To be on the safe side though, I would reccomend going to a local print shop or online and have them make you some sticky labels. Make something unique that LOOKS like a wine brand. The best part of this is that you can add your website somewhere in the graphic. Another option is to go to a graphic website like shutterstock and download an image you can edit to your needs. Again you can add your website URL somewhere in the image.. Take this to a print shop and you can make YOUR OWN Brand. I hope this helps. Thank you for visiting my site.